Let me preface this article by saying that it is orignally not my creation, but I liked this coin so much that I would like to use this information I received. Last year when I visited the Chicago Coin Club, I had a conversation with the treasurer, Steve Zitowski. He was telling me about this coin, which I have never heard about. For a side note, at the Chicago Coin Club, you can hear many things you have never heard about before. So, a few months later, this coin arrived on the mail with Steve's description of it. This article is a modified version of tthe letter, expanded with some of my findings. Now, here's where it gets interesting. 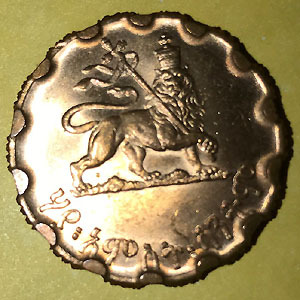 This coin is one of three issues of the same coin. The first (KM#35) was issued as a round 26 mm copper coin. At the same time, silver 50 Santeem coins were issued, with essentially the same diameter, and obverse/reverse, except for the small written amount on the reverse. Understand that the overwhelming population was then, as now, illiterate, so that was moot. Many of the round, copper, 25 Santeem coins were silver-plated, and passed for 50s! Pretty quickly, the government realized their mistake; no doubt someone lost their head as a consequence, and recalled all the round 25s that they could, and crudely cut scalloped notches in the edges, also slightly reducing the size of the coins. 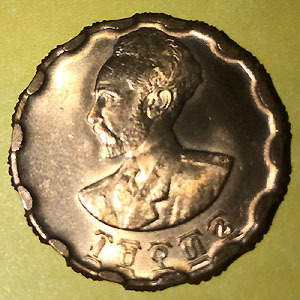 The crudely modified coin became KM# 36. The enclosed coin was actually minted with the new edge is also KM#36. The coin though it was minted as is, and not altered, definitely retained the crude feel to it, the edges are higher, and the segmentations are rough. For the touch, it almost feels as if it was designed this way purposefully.